It’s almost 3 A.M., and of course, I can’t sleep. I’ve had this problem for as long as I can remember – so I decided to blog. Today, err yesterday I guess you could say, was filled with work and errands, but tonight’s thought is surrounded around my first salary paycheck. I’ve had my check sitting in my room for awhile now, and finally got to depositing it this afternoon. I must say, it was pretty exciting considering I was used to getting paid per assignment, or for a part-time job. The excitement got me into wanting to be more responsible and organized. Don’t get me wrong, I am very responsible and organized to begin with, but now I want to take it to a new level. I closed out my other bank accounts so I’d only have one, opened a new savings, cut up my credit cards and updated my iSpending app (best app to manage your money). One, I don’t know why I had multiple bank accounts because that made everything confusing, and two, I never realized how much credit sucked until I was comparing the numbers from last month to this month. I always pay my bills on time, and thought I was really eliminating my debt, but nope – interest is a pain in the you know what. Thankfully, I have amazing credit, but there is no reason for me to have them anymore so I cut up the cards with the exception of one for emergencies. 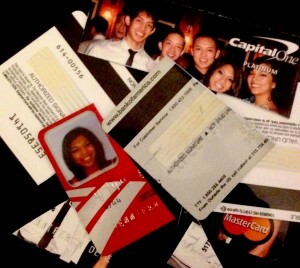 Random – I was really sad to cut up the Capital One card because I had a family picture on it (yes, Capital One does this and it’s free). Anywaaaaay – for those who know me, despite being on salary, I am still going to be cheap lol – and I have no shame to admit that. I’m going to be OCD with my spending habits, have zero debt and save up to get my first car under my name in March (I took the one my brother and I shared when I lived in Chicago and he is taking it back home when he visits me – thank you Mom and Dad for always providing). I highly recommend to not get caught up in credit cards, but if you absolutely need one, I recommend Chase Freedom or The Bank of America Rewards Program. Both give you cash back and points, so there’s at least some kind of benefit. Well, that’s all I have for tonight – I’m going to attempt to go to sleep. Goodnight!